Super-Trex® products are specifically designed to withstand high heat and provide excellent protection in harsh applications. These high-quality welding cables are designed with our proprietary Super-Trex TSE jacket to protect the conductors from chemicals, abrasion, oils, impact, ozone, tearing, flame, and heat. The insulation system resists oils, coolants, acids, and chemicals. Super-Trex welding cables are also available to meet the most demanding needs for flexibility and superior abrasion resistance. TPC Wire & Cable Corp.’s super flexible welding cables typically last longer than most commercially available welding cables. On average, a TPC welding cable has the capability of being in service for over 13 months without repair or replacement. 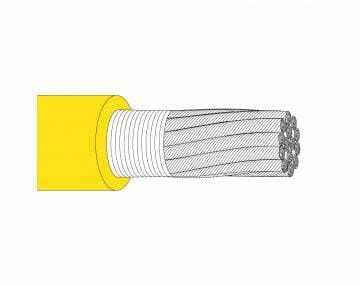 Please click the image of a product to browse our selection of welding cables. Super-Trex® 600 Volt Welding Cables and Super-Trex® DC Welding Cables are designed to last longer than other commercial products. In fact, you can expect these TPC products to work efficiently for up to 13 months without need for repair or replacement. Find a TPC case study that matches your environment. See the savings. What Makes TPC Welding Cable Different? Our proprietary jacket compounds are designed to be 25% thicker than ordinary welding cable increasing the resistance to tearing, abrasion, and impact in the extreme industrial environments they’re used in. Welding cable is also available in TPC’s signature security yellow jackets as well as black and red. Footage markers on the jacket make for easy inventory control and allow for precise measurement and cutting. Cable jackets for the 600 Volt and DC welding cables remain flexible in any situation since they contain 2 -1/2 times more copper stranding than conventional welding cable. Again, this improves impact resistance contributing to a longer lasting cable. What Applications Can Welding Cable Be Used In? No matter what type of welding application you work with on a daily basis, TPC products are sure to be a suitable choice. The 600 Volt and DC welding cables can be used in many of the following applications. Check application variables before choosing the proper cable. TPC helps its customers avoid unplanned downtime by providing high-quality, high-performance super flexible welding cables that minimize frequent replacement from damage or wear. Contact us today.